Great Help to speed up your PC read it now! Home › Forums › Anything Goes › Great Help to speed up your PC read it now! 1. Free up disk space is to Freeing up Disk space can improve the speed of your hard drive and computer and there are many ways to free up hard drive spaceFor Window 7 users1.Click Start, click All Programs, click Accessories, click System Tools, then click Disk Cleanup. 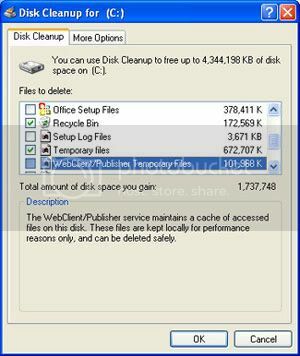 If several drives are available, you might be prompted to specify which drive you want to clean.2.When Disk Cleanup has calculated how much space you can free, in the Disk Cleanup for dialog box, scroll through the content of the Files to delete list.3.Clear the check boxes for files that you don't want to delete, and then click OK.For more options, such as cleaning up System Restore and Shadow copy files, under Description, click Clean up system files, then click the More Options tab.4.When prompted to confirm that you want to delete the specified files, click Yes.After a few minutes, the process completes and the Disk Cleanup dialog box closes, leaving your computer cleaner and performing better. For Windows XP users1.Click Start, point to All Programs, point to Accessories, point to System Tools, and then click Disk Cleanup. If several drives are available, you might be prompted to specify which drive you want to clean. 2.In the Disk Cleanup for dialog box, scroll through the content of the Files to delete list. 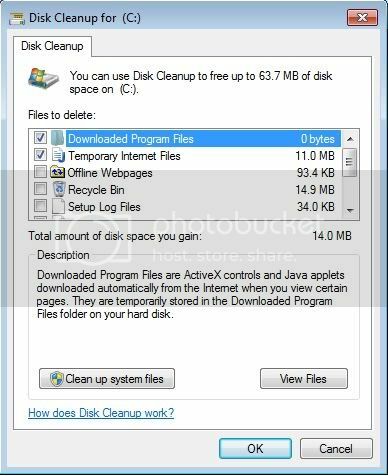 3.clear the check boxes for files that you don't want to delete, and then click OK.4.When prompted to confirm that you want to delete the specified files, click Yes.After a few minutes, the process completes and the Disk Cleanup dialog box closes, leaving your computer cleaner and performing better.